The holidays are coming up with the weather getting colder and finally some decent amount of rain in California last week. I'm glad I found these amazing finds to keep me hydrated as my skin dries up easily. Innisfree Second Skin Nourishing Mask - I stockpiled this from my recent trip to Korea, and it was definitely worth the haul since it was much cheaper there. The mask is like nothing I've ever used before as it seems to melt into your skin when you apply it to your face. It's a lot thinner than most masks, especially compared to the popular hydrogel ones. It's so thin that I seem to forget that I have it on! It's really helping my skin and it comes in handy on those long flights when your skin gets especially dry. Nars Creamy Concealer - I used to use Dior's hydrating concealer, but it was cakey and didn't hydrate very well. This one does wonders on my dark eye circles and doesn't cake up. The creaminess is very hydrating and a little goes a long way. Son and Park Beauty Water - Apparently this is the holy grail in the Korean skincare world. I recently read reviews about it and picked one up while I was in Korea. At around $25, this is such a smart buy! It acts as a toner but doesn't just exfoliate, it also cleans and moisturizes. I start with my double cleanse (cleansing oil followed by foam cleanser) and then apply the beauty water. It gets rid of any excess makeup I might have missed and preps my skin for essence. Even without additional moisturizing, it leaves my skin feeling dewy. Jill Stuart Silk Powder Foundation - The Jill Stuart makeup and skincare line is absolutely beautiful and it's perfect for the floral, romantic side of any girl. This silk powder foundation leaves a silky finish that conceals my pores and with just a little dab, it keeps my makeup in place. You'll be receiving compliments on the beautiful powder compact when you whip it out for a touch-up! Voluspa Candles - I didn't really use candles before and never really gave them much thought until I saw such great reviews for these during the Nordstrom Anniversary Sale. Ever since I got them, I haven't gone a day without lighting them! The scent is very soothing, and doesn't have a harsh or annoyingly pungent smell. It almost immediately calms my senses and I love how the mini ones (4 oz) I purchased lasted about a month with everyday use. Loving all of your picks! <3 Really want to try the Son and Park Beauty Water :) I'm always on the lookout for new toners. 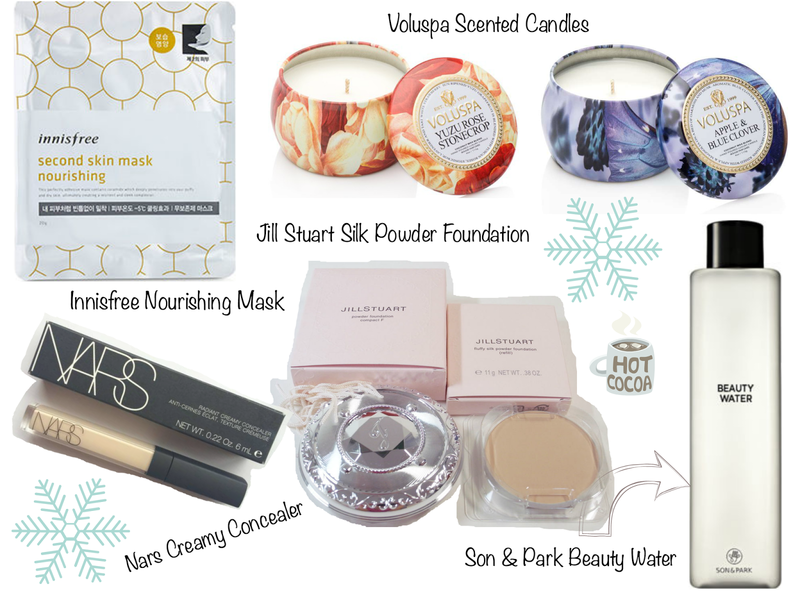 And yes, those Voluspa candles are some of my favorites too! Thank you so much for sharing!